This puzzle is a triangular pyramid of 10 odd shaped coloured pieces (actually they are truncated rhombic dodecahedra) which are held together using 4 small cubical connectors. A move consists of pulling off a small pyramid of 4 pieces, and replacing it in any orientation. The pieces have 4 faces (3 adjacent faces of the rhombic dodecahedron) which have one of four colours. For any pair of colours there is a piece with two faces of each colour. There are 6 such pieces. The other 4 pieces have three colours, so they all have one colour missing and one colour repeated on two faces. No two of them have the same missing colour, and no two of them have the same colour repeated. In the solved position, Each side of the pyramid has a single colour. Therefore the 4 tri-coloured pieces should go in the corners, and the other 6 on the edges. 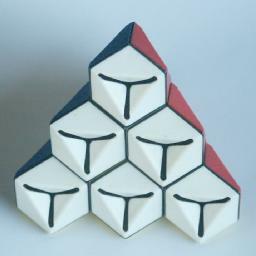 If you restrict the moves to those which don't move a corner piece from its place, then this puzzle mimics the Pyraminx. This puzzle was patented by Rubik in Hungary on 28 March 1991 (HU 207,233), and the patent was granted two years later. This leaves 10!·1210 / 48 = 4,680,952,735,334,400 positions. It should also be noted that there are actually 2·45 = 2048 solved positions, because the 6 middle pieces each have 4 ways they can be placed correctly, but they are restricted slightly by the second condition above. Rubik's page, the manufacturer's homepage. The moves of this puzzle are very hard to describe accurately, and I can think of no good notation for it, so this solution may be hard to follow. Phase 1: Place the corner pieces in position. This phase is easy, as we do not worry about the orientation of the pieces yet. First find a corner piece, i.e. a piece with three colours. Make any move that doesn't move any previously placed corners, and which brings it to a corner that has no corner piece yet. The only time when this is not immediately possible is when three corners have been placed and the fourth one lies between them. Then twisting a suitable pyramid will move the piece adjacent to its destination, and it can then be put in position as normal. Phase 2: Twist the corner pieces correct. First all corners must be twisted to show three colours, so find any corners that only show two colours and do the steps below. Let A be a pyramid of which its corner piece shows only two colours, and let B be any other pyramid. The following moves will twist the tip of A to hide one of its repeated colours. Note that the pyramids A and B have one piece in common, which I'll call the intersection. Move pyramid A to bring its corner piece into pyramid B, i.e. to the intersection. Move B to so that the piece at the intersection is turned so that one of its faces with the repeated colour is placed inside pyramid A. Move A to place its corner piece back in position, now showing all three colours. Move B to place its corner piece back. Repeat steps b-f above till all corners show three colours. Choose one of the colours, and find the three corners with that colour. Turn the three corners to bring that colour to the same face of the puzzle. Let A be a tip with a corner piece which has to be mirrored, and let B be any adjacent tip. Move pyramid A to bring its corner piece to the intersection of A and B, such that the second face of the piece's repeated colour does not lie inside pyramid B. Move B so that the repeated colour is placed inside pyramid A. Move A to place its corner piece back in position. Repeat the above for other corners if necessary until all the corners match up. Phase 3: Place the edge pieces in position. In this phase the orientations of the edge pieces are ignored, so the only moves that are needed are rotations, i.e. moves just like the Pyraminx. Find an incorrect piece (piece 1), a second incorrect piece (piece 2) which is in the place that piece 1 should be, and finally a third incorrect piece which is in the place that piece 2 should be. 1. Turn B clockwise (cw), A anti-clockwise (acw), B acw, A acw, B cw, A acw, B acw. 2. The moves above will have moved the three pieces around. If they moved in the wrong direction then repeat the sequence again to fix them. If the three pieces do not lie in the same pyramid, then there are two pyramids that each contain a pair of them. Let A and B be those two pyramids. Let c be the piece that lies in both A and B, b the other piece in B and a the other piece in A. 1. Move B to place b correctly in the place of c.
2. Move A to put a at c (if possible correctly twisted in relation to the B pyramid). 3. Move B back to its original position. 4. Finally move A back. With the two sequences above you can move all the pieces into the correct position, except possibly for the final two pieces. If you find that two pieces need to be swapped but that the remaining ones are in position then you will have to solve the puzzle with the whole pattern in mirror image. This basically means you will have to swap two of the corner pieces, and solve the whole puzzle again from phase 2. Phase 4: Twist the edge pieces correct. Find any edge piece that only shows one colour. If there is an adjacent edge that is incorrect then use that as the second piece in the sequence below, otherwise use any correctly placed adjacent edge. Let A be the pyramid containing both pieces, and let B be the other pyramid containing the SECOND piece. 1. Move B to place this second piece correctly twisted in position. 2. Rotate A to bring the first piece into pyramid B. 3. Move B back into position. 4. Finally turn A back. Repeat the above until there are no edge pieces with only one colour showing. Find any edge piece that is upside down (i.e. its two colours need to be swapped). Let A and B be the pyramids that the piece belongs to. 1. Move A so that the piece stays in position but still shows two colours. 2. Move B so that it again shows two colours. 3. Move A back into correct position (piece now shows one colour). 4. Finally move B back. Repeat the above until all pieces are correct.